The relative contribution of the lymph and blood in the absorption of darbepoetin alfa (DA) from different s.c. injection sites was determined using a central lymph-cannulated sheep model. DA was administered to parallel groups either as a bolus i.v. injection (0.5 μg/kg) into the jugular vein or as a bolus s.c. injection (2 μg/kg) into the interdigital space, the abdomen, or the shoulder. In the lymph-cannulated groups, the thoracic lymph duct was cannulated for continuous collection of central lymph, and blood samples were periodically collected via the jugular vein in all the groups. The concentration of DA in serum and lymph was determined by enzyme-linked immunosorbent assay. The total fraction of the dose reaching the systemic circulation and the fractions absorbed via the lymph and the blood were determined. A pharmacokinetic model was constructed to simultaneously fit the data from all the treatment groups. Absorption was essentially complete for all three injection sites in non–lymph-cannulated s.c. groups, but the rates of absorption differed significantly. Based on the modeling results for the lymph-cannulated groups, the lymphatics represented the predominant absorption route for both the interdigital (90 ± 1%) and the abdomen (67 ± 9%) injection sites. Fluorescein isothiocyanate dextran visualization studies revealed that the lymph draining the shoulder injection site entered the thoracic lymph duct distal to the point of cannulation, effectively precluding collection of thoracic lymph from this site. For that reason, the contribution of the lymphatics following injection in the shoulder could not be determined using these cannulation procedures. Darbepoetin alfa (DA) (Aranesp, Amgen, Thousand Oaks, CA) is a hyperglycosylated analog of recombinant human erythropoietin (rHuEPO) that stimulates red blood cell production (erythropoiesis) by the same mechanism as rHuEPO (Macdougall, 2000). DA is a 165-amino acid protein containing five N-linked oligosaccharide chains, whereas rHuEPO has only three oligosaccharide chains (Egrie and Browne, 2001). The additional carbohydrate chains increase the molecular mass of the glycoprotein from approximately 30,400 to 37,000 Da, which results in a considerable prolongation of half-life to 25 h after i.v. administration relative to 8.5 h after i.v. administration of rHuEPO (Macdougall et al., 1999). The longer half-life for DA allows for once-weekly s.c. administration compared with twice- or thrice-weekly administration for rHuEPO (Egrie and Browne, 2001). DA is currently used for the treatment of anemia induced by cancer chemotherapy, chronic renal failure, and other disorders. After s.c. administration, proteins enter the systemic circulation either by direct absorption into s.c. blood capillaries or indirectly via absorption into the lymphatic capillaries present within the interstitial space. Previous reports in the literature have consistently suggested that proteins larger than approximately 16 kDa are absorbed primarily via the lymphatics (Supersaxo et al., 1988, 1990; Charman et al., 2000, 2001; McLennan et al., 2003, 2005). Much of the information to date has been generated following protein injection into either the lower region of the hind leg or the interdigital space of the hind leg in sheep. These injection sites were used for practical reasons in that they allowed cumulative and quantitative recovery of the peripheral lymph draining the injection site via cannulation of the popliteal lymph duct, which collects all the lymph from the lower leg. With this experimental design (i.e., collection of peripheral lymph), the absorption process could be studied without consideration of the effect of transport through the larger lymphatics and lymph nodes (Porter and Charman, 2001). However, the question remains as to whether these studies provide a realistic estimation of the contribution of the lymphatics to the absorption process, given that the injection sites are not representative of those typically used in humans. We have recently reported that DA is predominantly taken up by the lymphatics with approximately 90% of the dose recovered in peripheral lymph following injection into the interdigital space of the hind leg using a sheep model (McLennan et al., 2006). In these studies, the rate of absorption following s.c. injection was considerably faster than that seen in humans, with a time to the maximum concentration (Tmax) of 8 h compared with 36 to 72 h in humans (Macdougall et al., 1999). It was proposed that the more rapid absorption of DA in sheep could have been because of the use of the interdigital injection site compared with injection in the arm, thigh, or abdomen in humans. The influence of different s.c. injection sites on the rate and extent of protein absorption has been shown for several different proteins in humans (Koivisto and Felig, 1980; Beshyah et al., 1991; Macdougall et al., 1991; Jensen et al., 1994; ter Braak et al., 1996; Owens et al., 2000). Although the extent of absorption is typically consistent for different injection sites, variability in the rate of absorption has been reported. These differences are likely because of differences in the s.c. blood and lymph flow in different anatomical regions; however, the relative contributions of the blood and the lymph in the overall absorption profile from different s.c. injection sites have not been reported previously. The current study was conducted to explore the role of injection site in dictating the absorption kinetics of DA and to characterize the role of the lymphatics in the absorption process. DA was used as a model protein for these investigations because it is known to be largely absorbed via the lymphatics (McLennan et al., 2006) and it can be readily assayed by enzyme-linked immunosorbent assay. 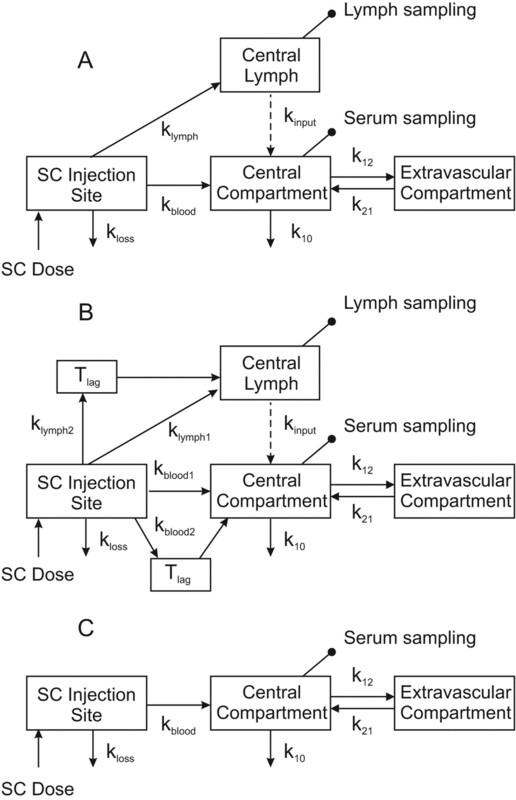 To study the influence of different injection sites, a central lymph-cannulated sheep model (Porter et al., 2001) was used with the assumption that the majority of the lymph draining the different anatomical injection sites is collected in the thoracic lymph duct before its entry into the systemic circulation (Guyton and Hall, 1997). Materials. Formulated DA and blank placebo for dilution were generously provided by Amgen. Commercial Quantikine in vitro diagnostic human erythropoietin enzyme-linked immunosorbent assay kits were purchased from R&D Systems (Minneapolis, MN). The i.v. catheters (133 mm, Angiocath, Becton Dickinson, Franklin Lakes, NJ) were used to catheterize the jugular vein for blood sampling. Sterilized medical grade polyvinyl cannulae with a 1.40-mm i.d. and a 1.90-mm o.d. (Paton Scientific, Victor Harbor, SA, Australia) were used for cannulating the thoracic lymph duct. The blood samples were collected into 5-ml glass tubes (Vacutainer, Becton Dickinson), and central lymph was collected into 120-ml polypropylene tubes (Sarstedt, Mawson Lakes, SA, Australia). A Heraeus Biofuge (Thermo Scientific, Waltham, MA) was used to centrifuge the blood and lymph samples. Study Design. The animal studies were conducted in accordance with the Principles of Laboratory Animal Care (NIH Publication #85-23, revised 1985) and were approved by the University of Melbourne Animal Experimentation Ethics Subcommittee. A parallel study design with i.v. control, s.c. control, and s.c. lymph-cannulated treatment groups was used in which a single dose of DA was administered to each animal. For the i.v. control group (n = 4), 0.5 μg/kg was administered by i.v. bolus injection of approximately 1 ml into the jugular vein. For the s.c. treatment groups, three different injection sites were used for both the control and lymph-cannulated groups (n = 4 for each group), and each sheep received 2 μg/kg by bolus s.c. injection of approximately 1 ml. During the experiment, sheep were housed in metabolic cages and had access to food and water ad libitum. Surgical Procedures. Adult male merino wether sheep were used in these studies. The weight range for sheep in the i.v. group was 33 to 42 kg, whereas the weight ranges for the interdigital, abdomen, and shoulder s.c. study groups were 38 to 57, 40 to 61, and 42 to 67 kg, respectively. The i.v. catheters were inserted into the jugular vein of all the sheep for collection of blood samples. For the central lymph-cannulated groups, the thoracic lymph duct was cannulated according to procedures described elsewhere (Porter et al., 2001). Antibiotics were administered by i.m. injection (600 mg of procaine penicillin) to the sheep immediately after surgery to reduce the likelihood of postoperative infection. Following an initial recovery period, sheep were transferred to cages and allowed to recover for 14 to 16 h before dose administration. The central lymph flow was monitored in the lymph-cannulated animals, and animals with a lymph flow of less than 30 ml/h were excluded from the study (Porter et al., 2001). Dose Administration and Sample Collection. The formulation of DA was a sterile, clear, and colorless solution containing 500 μg/ml DA. The dose for administration in the current study was prepared by dilution immediately before administration using a matching placebo formulation to obtain a 20-μg/ml solution for i.v. administration and an 80-μg/ml solution for s.c. administration. A bolus i.v. injection was administered to the i.v. control sheep via the noncatheterized jugular vein. The s.c. doses were injected as a bolus into the interdigital space of the hind leg, the abdomen ∼2 cm ventral to the lateral spinus processes and ∼2 cm cranial to the iliac fossa, or the shoulder ∼2 cm caudal to the line of the midhumerus. Blood samples were collected from all the animals before dosing, and the catheter for blood sampling was kept patent with heparinized saline (10 IU/ml). At the time of collection of each blood sample, an initial 1-ml volume of blood was withdrawn and discarded because of the presence of heparinized saline within the cannula, and a 5-ml blood sample was then collected. Following sample collection, the cannula was flushed with fresh heparinized saline. Blood samples for the i.v. and s.c. control groups were collected via the jugular vein catheter periodically over 168 h postdose. For the central lymph-cannulated groups, blood samples were collected over 24 to 48 h postdose. Central lymph was continuously collected from the cannulated animals into preweighed 120-ml polypropylene tubes, and the lymph volume was determined gravimetrically. Lymph was collected for 30 to 60 min before dosing, and postdose lymph samples were collected at hourly intervals for 24 h in the interdigital and shoulder groups and for 48 h in the abdomen group. This limited blood and lymph sampling schedule in the lymph-cannulated animals relative to that used for blood sampling in the control groups was necessary to avoid dehydration of the animals with continuous lymph collection. The longer sampling schedule for the abdomen group was necessary given the significantly slower rate of absorption for this injection site. Blood and lymph samples were allowed to clot for 60 min at room temperature and were then centrifuged at ∼2600g for 10 min to separate the supernatant. The supernatant was collected and stored at –80°C until analysis. Lymphatic Visualization Studies. Evaluation of the lymph transport data obtained after injection of DA in the shoulder revealed a seemingly lower level of transport into the thoracic lymph than was expected. As such, the pattern of lymph drainage from the shoulder injection site was examined in more detail using a high molecular mass (21 kDa) fluorescent tracer [fluorescein isothiocyanate (FITC) dextran, Sigma-Aldrich, Castle Hill, NSW, Australia]. In these studies, 2 ml of a 4-mg/ml solution of FITC dextran was injected into the shoulder injection site in two anesthetized animals using the same injection technique that was used for the shoulder s.c. treatment group. The surrounding lymphatics were carefully isolated to facilitate visualization of the uptake and transport of the FITC dextran from the injection site to the thoracic duct. Visualization of the fluorescent material was enhanced by viewing under a UV light. Assay Method. The concentration of DA in serum and central lymph samples was determined using a commercial enzyme-linked immunosorbent assay kit, and the assay procedure was conducted as recommended by the manufacturer. Standards for DA were prepared in the corresponding blank matrix (i.e., serum or central lymph) using the same DA solution used for dosing. Standards for the calibration curve constituted eight concentrations over a range of 0.13 to 6.25 ng/ml. Samples were diluted wherever necessary in the corresponding blank matrix before analysis to ensure that concentrations were within the range of the calibration curve. The predose central lymph collected from each animal was used for sample dilution and standard preparation for the analysis of the central lymph samples. Blank sheep serum was collected from multiple sheep and pooled for the preparation of serum standards and for dilution of the serum samples. Assay Validation. Quality control (QC) samples were prepared at three concentrations (0.25, 2, and 4 ng/ml) in each matrix (i.e., either blank sheep serum or lymph), and aliquots were stored along with the study samples. QC samples were included in each assay to monitor sample storage stability and to validate the assay performance. The lower limit of quantification for the assay was defined as the lowest calibration standard that produced a signal at least twice the background absorbance and that had accuracy within ±15% and precision (%CV) of less than 15%. The QC samples in each assay were consistently within the ±15% of the nominal concentration, showing the accuracy of the method. The blank serum and lymph samples had no quantifiable concentrations of the endogenous sheep erythropoietin, suggesting either low cross-reactivity between human and sheep erythropoietin or concentrations of endogenous erythropoietin in sheep that were not detectable. The dilution of the study samples was also validated by preparing high-concentration samples that were within the expected range of the highest study sample concentrations. These high-concentration QC samples were then diluted to fall within the assay calibration range, and the concentration was estimated from the calibration curve. The measured concentrations were within ±15% of the nominal values, confirming that the dilution approach was appropriate. Noncompartmental Analysis. Noncompartmental analysis was conducted using WinNonlin (version 4.0, Pharsight Corporation, Mountain View, CA) for individual animals in the control groups. The area under the serum concentration-time profile from zero to infinity (AUCi.v. ), terminal half-life (t1/2), terminal rate constant (kel), mean residence time, serum clearance, and volume of distribution at steady state were determined following i.v. dosing. For the s.c. groups, the area under the serum concentration-time profile extrapolated to infinity (AUCs.c. ), t1/2, and kel were calculated, and the maximum serum concentration (Cmax) and the time to reach the maximum concentration (Tmax) were taken directly from the data. The fraction absorbed (Fabs) in the s.c. control groups was calculated from eq. 1 where AUCs.c. and AUCi.v. are the areas under the concentration-time profiles extrapolated to infinity for individual s.c. control animals and the mean of the i.v. group, respectively. Dosei.v. and Doses.c. are the administered doses in microgram per kilogram for the i.v. and s.c. control groups, respectively. For the lymph-cannulated groups, the cumulative mass of DA collected in lymph was expressed as a fraction of the administered dose (Flymph, eq. 2). The Fabs in the lymph-cannulated groups was calculated as a sum of the fraction of the dose recovered in lymph (Flymph) and the fraction in blood (Fblood), the latter of which was obtained by comparing the serum data for individual animals in the lymph-cannulated groups with the mean i.v. data using eq. 1. Compartmental Analysis and Modeling. Compartmental analysis of the data was performed using SAAM II (version 1.2, SAAM Institute, University of Washington, Seattle, WA). The mean data for each injection site were fit using the fractional S.D. for each datum based on the coefficient of variance for the corresponding mean data point. The model used for the i.v. control group was a standard two-compartment model. The models for the s.c. control and the s.c. lymph-cannulated groups are shown in Fig. 1. For the interdigital and abdomen injection sites, the data for the i.v., s.c. control, and s.c. lymph-cannulated groups were fit simultaneously while constraining the parameters k12, k21, k10, and Vc to be the same for each group (Fig. 1, A and B). In the case of the shoulder injection site, only the data for the i.v. and s.c. control groups were fit to the model (Fig. 1C, same parameters constrained). The absorption rate constants (klymph and kblood) in the noncannulated s.c. model were constrained to be equal to the corresponding rate constants in the cannulated s.c. model (interdigital and abdomen injection sites only). A rate constant for loss at the site of injection (kloss) was introduced in the s.c. models and was constrained to be equal for the noncannulated and cannulated groups. Goodness of fit for each of the models was assessed by the convergence of the least square regression, weighted residual sum of squares, and the precision of parameter estimates. Equation 3 describes the total fraction of the dose absorbed, whereas eqs. 4 and 5 describe the individual fractions absorbed via the lymph and the blood, respectively. Proposed pharmacokinetic models for DA administered as an s.c. bolus dose in the interdigital space (A), the abdomen (B), and the shoulder (C). For the interdigital and abdomen groups, the central lymph-cannulated, noncannulated control, and i.v. models were fit simultaneously, whereas for the shoulder group, the noncannulated control and i.v. models were fit simultaneously. The dotted line is a transfer rate in the control group and was not included in the cannulated model. Statistical Analysis. Statistical analysis was performed using SPSS version 11.5.0 (SPSS Inc., Chicago, IL), and the significance was tested at α = 0.05. Noncompartmental Pharmacokinetics of DA. After i.v. administration, the serum concentrations of DA decreased in a biexponential manner, showing an initial distribution phase and a subsequent elimination phase (Fig. 2A). The terminal t1/2 and serum clearance were 26.3 ± 3.4 h and 2.24 ± 0.31 ml/h/kg, respectively. It is evident from the volume of distribution at steady state (Table 1) that DA was not extensively distributed outside the serum. The values obtained are consistent with those previously described using the same animal model (McLennan et al., 2006). Values represent the mean ± S.D. for n = 4 animals. 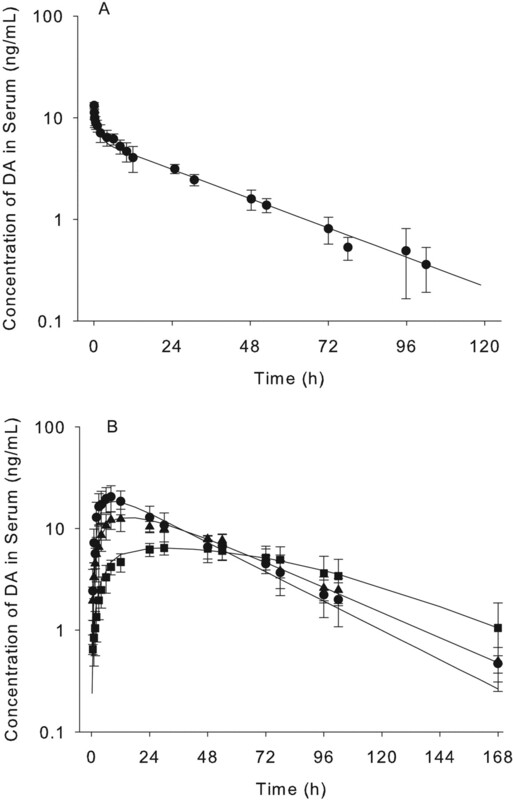 DA serum concentration versus time profiles following i.v. administration at 0.5 μg/kg (A) and s.c. administration to non–lymph-cannulated control animals at 2 μg/kg (B) with injection in the interdigital space (circles), abdomen (squares), or the shoulder (triangles). The symbols represent the experimental data (mean ± S.D., n = 4), and the model-predicted data are represented as a solid line. In the noncannulated s.c. control groups (Fig. 2B), the absorption from the interdigital and the shoulder injection sites was relatively fast with a Tmax of approximately 8 h for each compared with approximately 18 to 72 h for the abdomen group. The overall bioavailability was essentially complete for each of the three injection sites (Table 1). The terminal elimination half-life for each of the noncannulated s.c. control groups was not statistically different than that of the i.v. control group (Table 1). In the central lymph-cannulated group in which DA was administered by s.c. injection into the interdigital space (Fig. 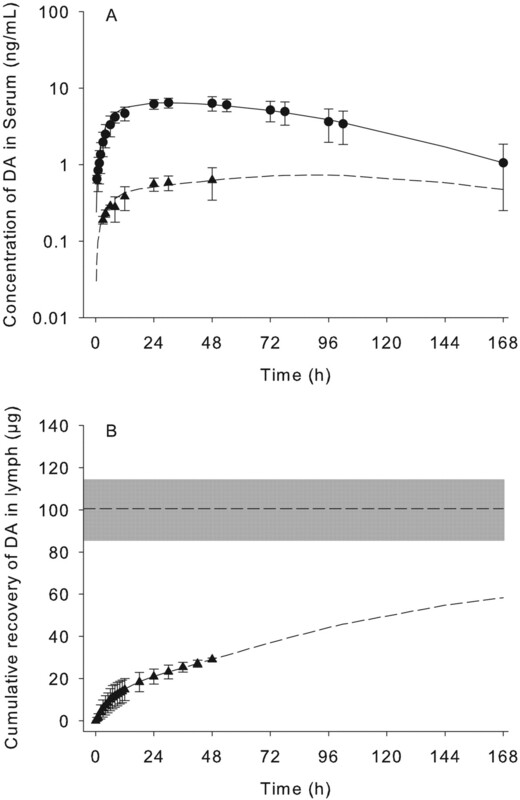 3), DA entered the systemic circulation predominantly via the lymphatics with 92 ± 15% of the administered dose recovered in thoracic lymph over 24 h. The total fraction absorbed, obtained by summing the fraction of the dose absorbed via the lymph and the blood, was not statistically different than that for the noncannulated control group using the same injection site (Table 1). 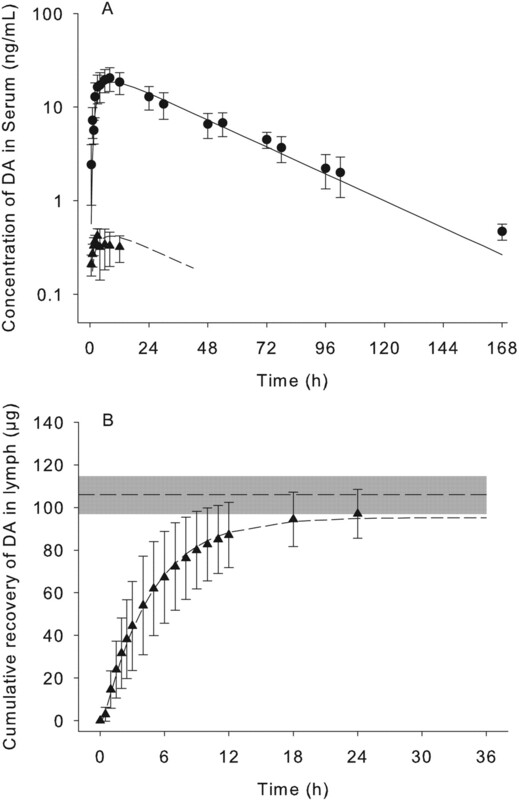 The lymphatic recovery of DA following injection into the abdomen in the lymph-cannulated group could not be completely quantified over the 48-h postdosing period, which represents the maximum cannulation period that can be utilized with this animal model to avoid dehydration (Porter et al., 2001). The serum and lymph profiles for the abdomen group (Fig. 4) suggest that absorption was still occurring at the conclusion of the 48-h sampling period. The estimated lymphatic recovery of DA following injection into the abdomen during the 48-h lymph collection period was 28 ± 4%, and the dose recovered in the systemic circulation over the same time period was 8.2 ± 3.4%, the sum of which (37 ± 7%) was considerably lower than that for the noncannulated control group, for which the calculated Fabs was 85 ± 20%. Calculation of the fractional AUC in the noncannulated abdomen group up to 48 h gave a value of only 33 ± 5%, which is close to the total percentage recovered in blood and lymph in the lymph-cannulated abdomen group over the 48-h collection period. The initial data analysis for the absorption of DA following s.c. injection into the shoulder indicated that absorption occurred predominantly via the blood, with 75 ± 10% of the administered dose recovered in the blood, whereas only a very small fraction was recovered in the lymph over 24 h. This surprisingly low recovery of DA in lymph following injection into the shoulder prompted an additional visualization study in which a 21-kDa FITC dextran was injected into the shoulder region in two sheep in an attempt to follow the transfer pathway from this injection site into the systemic circulation. Previous studies conducted with proteins of a size similar to that of the FITC dextran have indicated that a large proportion of the dose would be absorbed via the lymphatics (Charman et al., 2000). In both animals, visual assessment using a UV light indicated that the FITC dextran was taken up by the surrounding lymphatics and entered the thoracic lymph duct at the junction with the internal jugular vein (Fig. 5). This site of entry was approximately 2 cm distal to the site of cannulation used in the lymph-cannulated animals such that DA absorbed from the shoulder injection site into the local lymphatics would have escaped collection via the thoracic lymph duct cannula and instead would have been returned to the systemic circulation via the jugular vein (i.e., “downstream” of the thoracic cannulation site). This is consistent with the high recovery in blood and the low recovery in lymph following injection into the shoulder region in lymph-cannulated sheep. Unfortunately, given that the lymphatic entry point was close to the junction of the thoracic duct and the jugular vein, it was not possible to change the lymph cannulation site in a manner that would have ensured collection of the lymph from this injection site. Attempts to obtain photographs that showed the absorption pathway of the FITC dextran injected into the shoulder region were unsuccessful, and it was not possible to visualize the fluorescence without the aid of a UV light. Compartmental Modeling. A two-compartment model with first-order elimination from the central compartment best described the disposition of DA after i.v. administration. The model-predicted data are shown in Fig. 2A, and the parameter estimates are shown in Table 2. Models were simultaneously fit to the mean data for n = 4 animals in each group; the S.D. reflects the confidence in the parameter estimates. For the s.c. groups, a two-compartment model was constructed to simultaneously fit the serum data for the interdigital and abdomen groups and the cumulative amount of DA in lymph (Fig. 1, A and B). Despite the monoexponential decrease in the concentration of DA in serum following s.c. administration, a two-compartment model was adopted based on the biexponential decrease following i.v. administration. The mean volume of the central compartment (Vc), elimination rate constant (k10), and intercompartmental distribution constants (k12 and k21) were constrained to be equal to the corresponding rate constants in the i.v. model. The absorption rate constants in the noncannulated s.c. control groups were forced to be equal to the corresponding rate constants in the lymph-cannulated groups. DA serum concentration versus time profiles following s.c. injection in the interdigital space, with the filled circles representing the noncannulated control data and the filled triangles representing the central lymph-cannulated data (A). B, illustrates the cumulative recovery (μg) of DA in lymph following s.c. injection in the interdigital space. Symbols represent the experimental data (mean ± S.D., n = 4), and the lines denote the model-predicted data. In A, the discontinuous line has been used to indicate the approximate nature of the predictions for the cannulated group given the paucity of data. The horizontal discontinuous line in B is the mean administered dose in micrograms, and the gray shaded area represents the S.D. DA serum concentration versus time profiles following s.c. injection in the abdomen, with the filled circles representing the noncannulated control data and the filled triangles representing the central cannulated data (A). B, represents the cumulative recovery (μg) of DA in lymph following s.c. injection in the abdomen. Symbols represent the experimental data (mean ± S.D., n = 4), and the lines denote the model-predicted data. In A and B, the discontinuous line has been used to indicate the approximate nature of the predictions for the cannulated group given the paucity of data. The horizontal discontinuous line in B is the mean administered dose in micrograms, and the gray shaded area represents the S.D. Schematic representation of the lymphatic absorption and transfer processes following injection of 21-kDa FITC dextran into the shoulder as indicated by visualization studies in two anesthetized sheep. The model shown in Fig. 1A was fit to the data from the interdigital injection site using first-order input and elimination for both the noncannulated and cannulated groups. Based on the results shown in Fig. 3, the model provided a good fit to the experimental data for both the serum and the lymph. When the model shown in Fig. 1A was applied to the data for the abdomen group, the fits were poor. The lymph profile for the abdomen injection site appeared to be biphasic (Fig. 4) and hence required a model with two first-order inputs into both the lymph and blood and a single first-order elimination process from the central compartment (Fig. 1B). One of the two first-order inputs for both the lymph and the blood also required a lag time to obtain a good fit to the data. Despite the incomplete data set and realizing that there will be error in the estimated parameters, the model appeared to adequately describe the available data and estimated the lymph recovery of DA to be 67 ± 9% following injection into the abdomen. Because the lymph data were found to be unreliable for the shoulder injection site, no attempt was made to fit the central lymph-cannulated data. The model shown in Fig. 1C with first-order input and elimination was fit to the noncannulated s.c. control data for the shoulder group (Fig. 2B). Although the lymphatic absorption of protein drugs following s.c. injection has been previously reported (Supersaxo et al., 1988, 1990; Charman et al., 2000, 2001; McLennan et al., 2003, 2005), the injection site typically used has been the interdigital space in sheep, a site that is clearly quite different to clinically utilized injection sites in humans, which typically include the thigh, shoulder, or the abdomen. Previous studies with DA indicated a dramatic increase in the absorption rate following s.c. injection into the interdigital space in sheep (McLennan et al., 2006) compared with humans (Heatherington et al., 2001). The current studies were conducted to explore the role of injection site in dictating the rate of absorption of DA and to further examine the contribution of the lymphatics to the absorption of DA from injection sites more similar to those used in humans. The systemic availability of DA from the three s.c. injection sites was almost complete relative to the i.v. group, with Fabs in the noncannulated s.c. control groups being 106 ± 18, 92 ± 13, and 85 ± 20% for the interdigital, shoulder, and abdomen injection sites, respectively (Table 1). The rate of absorption from the three injection sites varied significantly, with the abdomen group showing the slowest rate of absorption (Fig. 2B). The absorption rate constants obtained by compartmental modeling of the noncannulated control groups were approximately 0.15, 0.08, and 0.02/h for the interdigital, shoulder, and the abdomen injection sites, respectively (Table 2). The continuous collection of central lymph in the s.c. cannulated group led to a significant reduction in Fblood to 6.3 ± 4.2% for the interdigital injection site (Table 1 and Fig. 3). Quantification of the fraction of DA in central lymph (Flymph) accounted for 92 ± 15% of the injected dose. This value is similar to that previously reported when peripheral lymph was collected using the same injection site (McLennan et al., 2006). Summing Flymph and Fblood for each animal, the value for Fabs was 99 ± 13% for the interdigital injection site, which was not statistically different to Fabs for the noncannulated s.c. control group (106 ± 18%). The comparable Fabs values in the noncannulated and lymph-cannulated groups illustrate mass balance and confirm that the 24-h sampling period used for this group was sufficient. The model shown in Fig. 1A provided good fits to the experimental data for both the noncannulated and cannulated groups following injection into the interdigital space. Absorption following injection into the abdomen was considerably slower than from the other injection sites, with a Tmax of approximately 48 h compared with approximately 8 h for the interdigital and shoulder injection sites (Table 1). Because it was not practical to sample beyond a maximum 48-h period in the cannulated animals because of the potential for dehydration and protein depletion, Fabs calculated using the data up to 48 h significantly underestimated the total absorption of DA following injection in this site. Further examination of the noncannulated control data for this injection site indicated that the fractional AUC up to 48 h represented only 33% of the total AUC, which was consistent with the total fraction absorbed in the lymph-cannulated group up to 48 h.
Application of the simplified model shown in Fig. 1A to the available serum and lymph data obtained following injection into the abdomen resulted in poor fits to the available experimental data. Visual inspection of the serum and lymph absorption profiles (Fig. 4) suggested the possibility of multiple absorption processes, which required two first-order input pathways, one with a lag time and one without. The resulting model (Fig. 1B) provided a reasonable estimation of the partial experimental profiles. Using the predicted estimates for Flymph (67 ± 9%) and Fblood (16 ± 2%), Fabs was calculated to be approximately 83%, which was in agreement with the experimental value obtained for the noncannulated control group (85 ± 20%). Even though the estimates are likely to be associated with error given the paucity of experimental data, it is reasonable to conclude that the lymphatic pathway represents the main route of absorption following injection into the abdomen. Unfortunately, the practical limitations of further sample collection after 48 h precluded a more rigorous quantitative assessment of the lymphatic absorption process for this injection site. At present, the basis for the very slow absorption profile evident following injection in the abdomen is not known. The later Tmax for the abdomen group, however, is more consistent with the absorption profile seen in humans where Tmax for DA is approximately 36 to 72 h following s.c. injection into the arm (Macdougall et al., 1999). The different absorption rates from different injection sites are likely to be related to regional differences in blood and lymph flow. It has been estimated that in “active” regions of the body (e.g., deltoid), one lymphatic junction in every 2 to 5 may be open, but in “motionless” regions (e.g., buttock), there may be only one junction in 50 to 100 that is open (Ballard, 1968). Similarly, blood flow also varies in different regions of the body, with blood flow being least in the buttock, intermediate in the thigh, and greater in the deltoid region (Evans et al., 1975). These regional anatomical differences may be the basis for the different absorption rates observed for the different injection sites because the shoulder and interdigital regions would be associated with considerably more movement than the abdomen region. Despite the very different rates of absorption for the different sites, the lymphatics represented the predominant absorption pathway for both the interdigital and abdomen injection sites. The contribution of the lymphatics in the shoulder group could not be determined using the described cannulation procedures. FITC dextran visualization studies revealed that the lymph draining the shoulder injection site entered the thoracic lymph duct at the junction of the thoracic duct and the jugular vein, which is in contrast to the entry points for most lymphatic ducts draining other regions of the body that join the thoracic duct at points significantly removed from this junction (Guyton and Hall, 1997). 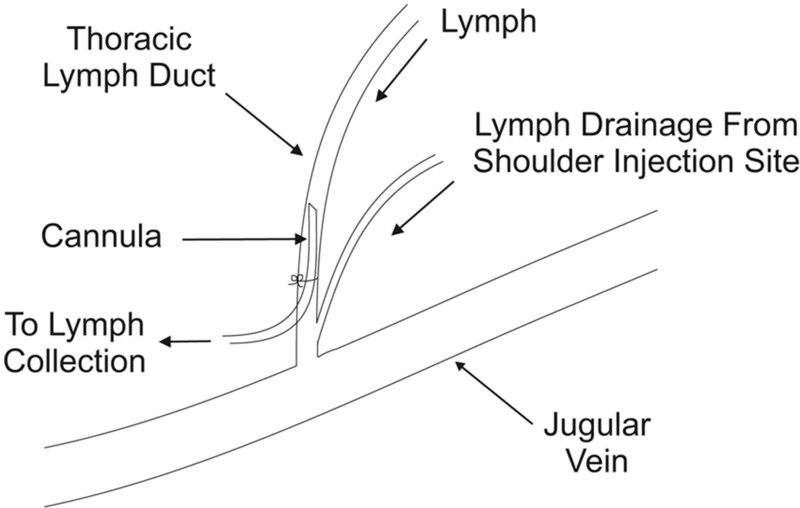 Because the cannula was inserted into the thoracic lymph duct approximately 2 cm cranial to the junction with the jugular vein, the lymph draining the shoulder injection site was not collected via the thoracic lymph duct cannula, resulting in higher than expected concentrations of DA in the blood and lower than expected lymphatic recovery. This limitation in the cannulation procedure therefore precluded an estimation of the actual contribution of the lymphatics in the absorption of DA following s.c. injection into the shoulder. The results described here are significant in that they provide further evidence for the role of the lymphatics in the absorption of protein drugs following s.c. administration using clinically relevant injection sites. The data indicate that even though the rate of absorption varied significantly with different injection sites, the contribution of the lymphatics was high for each site. The use of different injection sites, as well as species differences in the anatomical variation of different regions, is the most likely basis for different rates of absorption of DA and other protein drugs following s.c. administration. We thank Majella A. Snelling, Department of Veterinary Science, University of Melbourne, Victoria, Australia for technical assistance. J.K. received a Monash International Postgraduate Research Scholarship. ABBREVIATIONS: DA, darbepoetin alfa; rHuEPO, recombinant human erythropoietin; FITC, fluorescein isothiocyanate; QC, quality control(s); AUC, area under the curve; Fabs, total fraction of dose absorbed; Flymph, fraction of dose taken up by lymphatics; Fblood, fraction of dose absorbed into the blood. Ballard BE (1968) Biopharmaceutical considerations in subcutaneous and intramuscular drug administration. J Pharm Sci 57: 357–378. Beshyah SA, Anyaoku V, Niththyananthan R, Sharp P, and Johnston DG (1991) The effect of subcutaneous injection site on absorption of human growth hormone: abdomen versus thigh. Clin Endocrinol 35: 409–412. Charman SA, McLennan DN, Edwards GA, and Porter CJ (2001) Lymphatic absorption is a significant contributor to the subcutaneous bioavailability of insulin in a sheep model. Pharmacol Res 18: 1620–1626. Charman SA, Segrave AM, Edwards GA, and Porter CJ (2000) Systemic availability and lymphatic transport of human growth hormone administered by subcutaneous injection. J Pharm Sci 89: 168–177. Egrie JC and Browne JK (2001) Development and characterization of novel erythropoiesis stimulating protein (NESP). Nephrol Dial Transpl 16 (Suppl 3): 3–13. Evans EF, Proctor JD, Fratkin MJ, Velandia J, and Wasserman AJ (1975) Blood flow in muscle groups and drug absorption. Clin Pharmacol Ther 17: 44–47. Guyton AC and Hall JE (1997) The circulation, in Human Physiology and Mechanisms of Disease, pp 115–189, WB Saunders, Philadelphia. Heatherington AC, Schuller J, and Mercer AJ (2001) Pharmacokinetics of novel erythropoiesis stimulating protein (NESP) in cancer patients: preliminary report. Br J Cancer 84 (Suppl 1): 11–16. Jensen JD, Jensen LW, and Madsen JK (1994) The pharmacokinetics of recombinant human erythropoietin after subcutaneous injection at different sites. Eur J Clin Pharmacol 46: 333–337. Koivisto VA and Felig P (1980) Alterations in insulin absorption and in blood glucose control associated with varying insulin injection sites in diabetic patients. Ann Intern Med 92: 59–61. Macdougall IC (2000) Novel erythropoiesis stimulating protein. Semin Nephrol 20: 375–381. Macdougall IC, Gray SJ, Elston O, Breen C, Jenkins B, Browne J, and Egrie J (1999) Pharmacokinetics of novel erythropoiesis stimulating protein compared with epoetin alfa in dialysis patients. J Am Soc Nephrol 10: 2392–2395. Macdougall IC, Jones JM, Robinson MI, Miles JB, Coles GA, and Williams JD (1991) Subcutaneous erythropoietin therapy: comparison of three different sites of injection. Contrib Nephrol 88: 152–156. McLennan DN, Porter CJ, Edwards GA, Brumm M, Martin SW, and Charman SA (2003) Pharmacokinetic model to describe the lymphatic absorption of r-metHu-leptin after subcutaneous injection to sheep. Pharm Res 20: 1156–1162. McLennan DN, Porter CJ, Edwards GA, Heatherington AC, Martin SW, and Charman SA (2006) The absorption of darbepoetin alfa occurs predominantly via the lymphatics following subcutaneous administration to sheep. Pharm Res 23: 2060–2066. McLennan DN, Porter CJ, Edwards GA, Martin SW, Heatherington AC, and Charman SA (2005) Lymphatic absorption is the primary contributor to the systemic availability of epoetin alfa following subcutaneous administration to sheep. J Pharmacol Exp Ther 313: 345–351. Owens DR, Coates PA, Luzio SD, Tinbergen JP, and Kurzhals R (2000) Pharmacokinetics of 125I-labeled insulin glargine (HOE 901) in healthy men: comparison with NPH insulin and the influence of different subcutaneous injection sites. Diabetes Care 23: 813–819. Porter CJ and Charman WN (2001) Transport and absorption of drugs via the lymphatic system. Adv Drug Deliv Rev 50: 1–2. Porter CJ, Edwards GA, and Charman SA (2001) Lymphatic transport of proteins after s.c. injection: implications of animal model selection. Adv Drug Deliv Rev 50: 157–171. Supersaxo A, Hein W, Gallati H, and Steffen H (1988) Recombinant human interferon alpha-2a: delivery to lymphoid tissue by selected modes of application. Pharm Res 5: 472–476. Supersaxo A, Hein WR, and Steffen H (1990) Effect of molecular weight on the lymphatic absorption of water-soluble compounds following subcutaneous administration. Pharm Res 7: 167–169. ter Braak EW, Woodworth JR, Bianchi R, Cerimele B, Erkelens DW, Thijssen JH, and Kurtz D (1996) Injection site effects on the pharmacokinetics and glucodynamics of insulin lispro and regular insulin. Diabetes Care 19: 1437–1440.